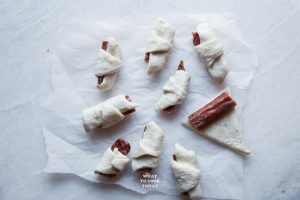 Mini Lap Cheong Sausage Pigs in a Blanket – Chinese style sausage with its smoky and sweet taste wrapped in crescent rolls makes a super easy and delicious appetizer or snack. It rained 2 days ago and then I was thinking wow…the weather has been pretty mild for December because it was around 40s at that time. I totally jinxed the whole thing! It snowed after that rain and temperature dropped to like 18 F. Yup…that layer of ice formed underneath that snow!! My car got stuck several times on the road because of the ice! Minnesota..Minnesota!! This is exactly why I don’t like you in the Winter! Somebody GET ME OUT OF HERE! My 4-year old said “Mama..I pray to God so our car won’t be stuck again!”. That totally just melted my heart right there! On a lighter note, let’s talk lap cheong! What in the world is lap cheong! It’s a Chinese style sausage! 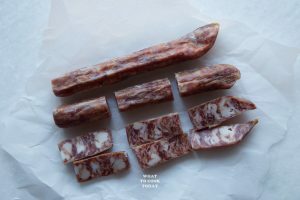 or known as La There are several different kinds of Chinese sausages, but lap cheong is usually made with fatty pork, dried, smoked and sweetened! The Asian likes to use it to make fried rice or any rice dishes. It’s truly amazing this thing! 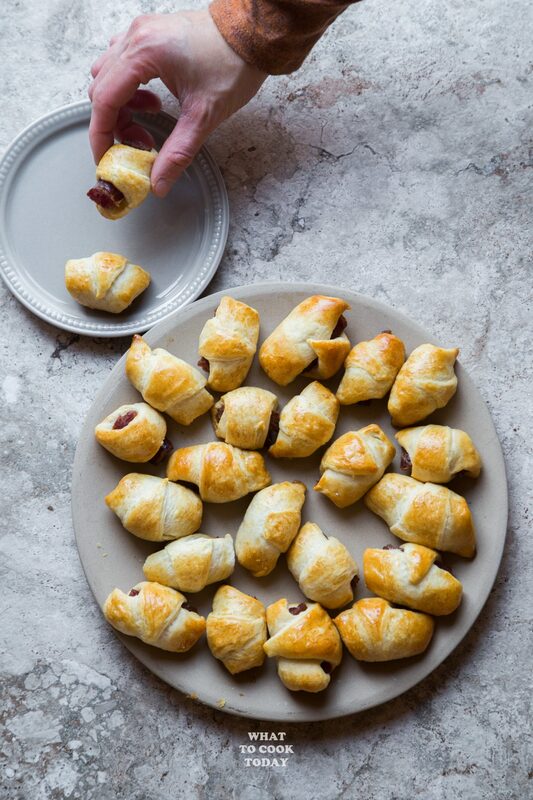 I like sausages of all kind, but why not lap cheong in a blanket? You can get them at Asian grocery store, though I’ve found some at Western grocery store here in Minnesota too (Cub Foods to be exact, at their ethnic food aisle). 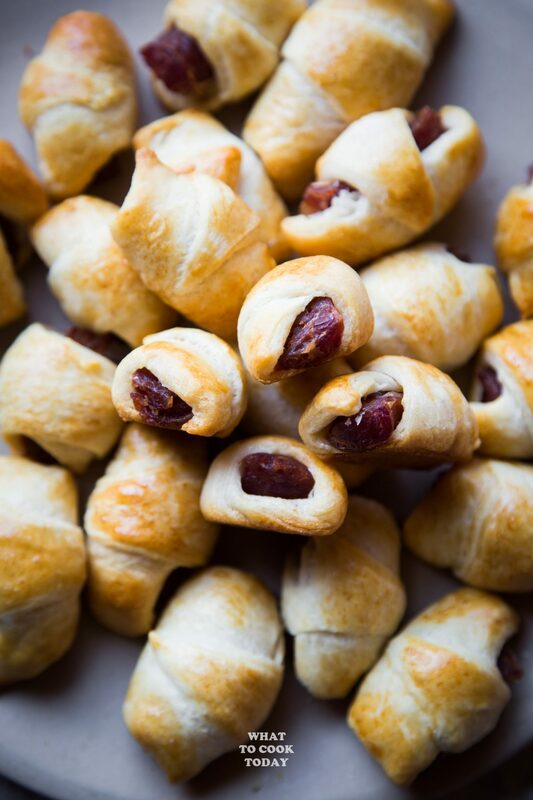 It’s so easy to gobble up this Mini Lap Cheong Sausage Pigs in a Blanket thinking that this thing is harmless LOL! But I suppose the sweater and thick coat kinda hide everything we consume! (until Summer arrives!). At least these are mini versions 😉 just exercise some self-control if possible! 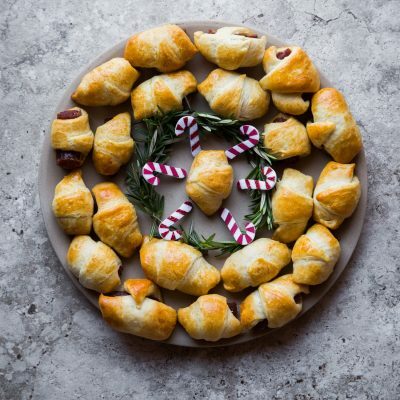 They are super easy to make, only 2 ingredients. I use an egg wash to brush the rolls because it gives that nice golden brown to the crescent rolls. 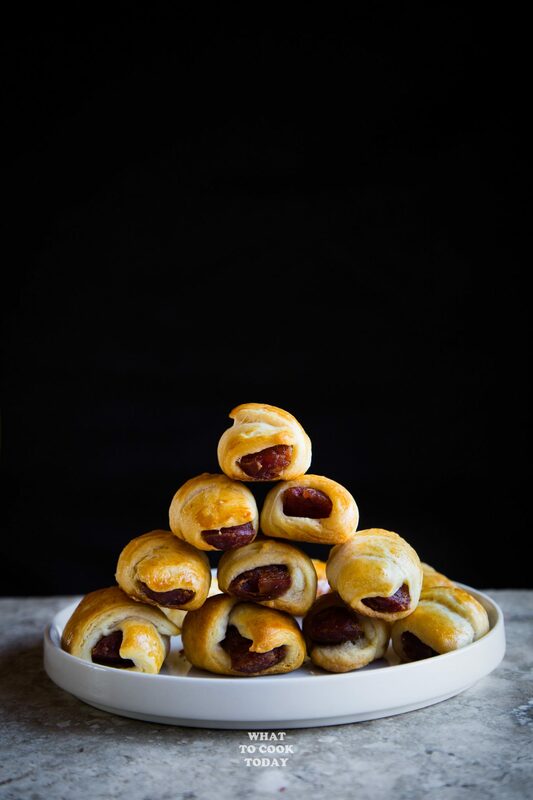 These Mini Lap Cheong Sausage Pigs in a Blanket inspiration comes from Viet World Kitchen. Preheat oven to 375 F. Line baking sheet with aluminum foil. 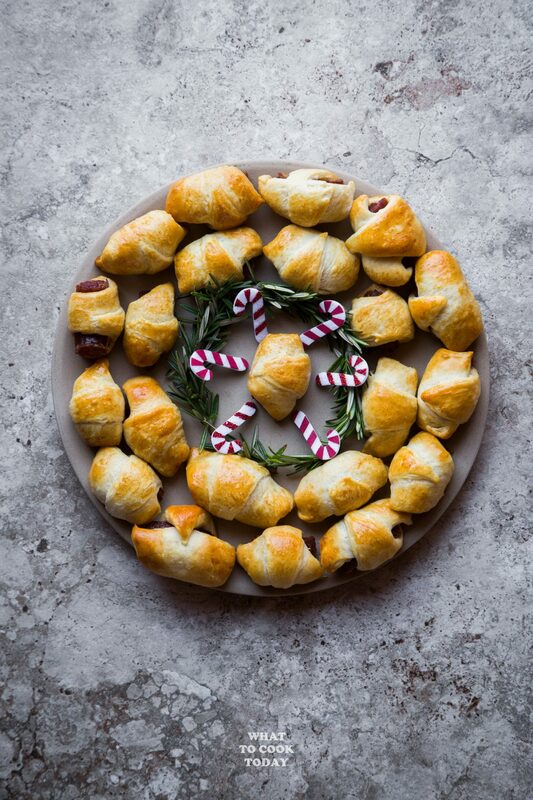 Unroll the crescent roll and separate the dough into 8 triangles. Cut each triangle into 3 narrow triangles lengthwise. These are EVERYTHING. 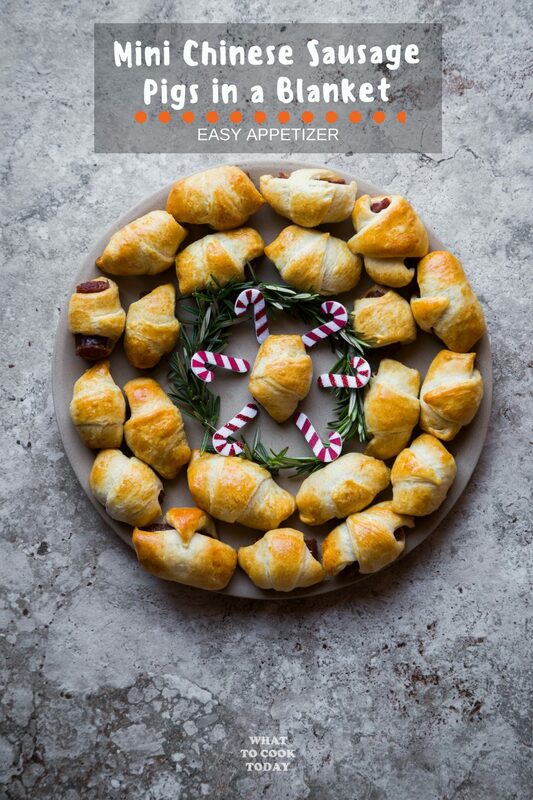 So much better than my usual party apps but still something that everyone can enjoy- definitely need to try! These look really good! I love Chinese sausage. Costco carries this sausage too. Really? I haven’t seen it at our Costco here! I gotta take a closer look next time!!!! Hi Adina, oh yes…I know German sausages are amazing!!!! 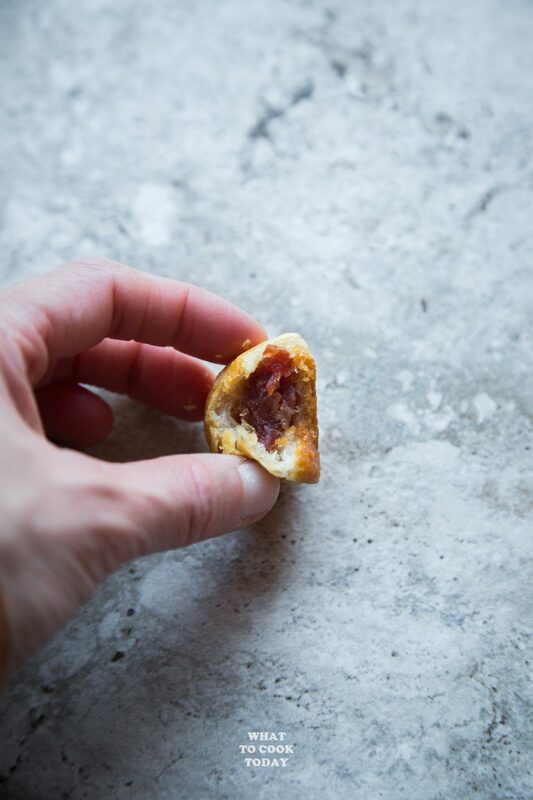 They won’t taste the same with Chinese Sausage, but they will still taste delish!